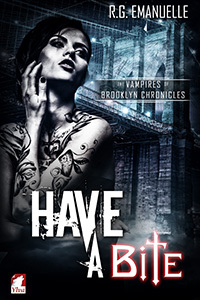 I’ve been at the edge of my seat for months, waiting to talk more about my new novella, Have a Bite, book 1 in The Vampires of Brooklyn Chronicles. The release date is May 13 (yes, that’s Friday the 13th!) and I’m so excited to reveal the cover now. So, here it is. This giveway is being hosted by Book Enthusiast Promotions. Still not sure if you’ll be interested? Why not read an excerpt? I’ve got one right here for you. I hope you like it. Nervous glances from the crew went in Delphine’s direction. No one wanted to piss off the boss. Ramona, the sous chef, eyeballed the other cookson the line,as she as tossedcaramelized onions in a pan. One by one, waitstaffrushed in and out andshouted out customers’ orders, cutting through the kitchen noise. Dell nodded and went back into the kitchen, taking one last look at the man. He turned his head slightly, then quickly turned it back, as if surreptitiouslychecking to see who was behind him. “Don’t worry.” Delphine looked at the list hanging on the refrigerator with the desserts and quantities. “I think you made plenty.How did the sugar cage turn out this time?” She referred to one aspect of Chantel’s latest signature dessert that she had been trying to perfect, a complicated affair that also featured chocolate foam, white chocolate-covered rose petals, and caramel-pistachio brittle. Delphine turned to face the woman. She was young, maybe about twenty-five, slender, with blond hair down to her shoulders and edged with blue. Her skin was pale, and her eyes halfopen with the promise of seduction. This was nothing new for Delphine. Many pretty young things had waited for her outside the restaurant, ready to offer themselves to her. They were like groupies. Cool! Make sure to go to the Rafflecopter site, if you haven’t already.